I called the apparent suicide of Benjamin Lim, the 14 year old boy who was arrested and interrogated by the police without his parents or a lawyer being present a “wholly tragic and unnecessary death“. In Parliament yesterday the Law Minister Shanmugam entered the fray in what can only be described as The Pot Calling The Kettle Black. Shanmugam hit out at those who have criticised the police treatment of and lack of safeguards for suspects and particularly juveniles like Benjamin. He singled out the President of the Law Society, Thio Shen Yi for his statements in the 17 February edition of the Singapore Law Gazette which he said “effectively imply that Benjamin killed himself because of police intimidation” (see CNA report here). Shanmugam said that Thio had no insight into the boy’s state of mind when he allegedly committed suicide and was not qualified to comment since he was not a psychologist. I say that Mr Shanmugam is even less qualified to comment. Only the Attorney General can decide whether a case will proceed to prosecution after SPF has passed on the results of their investigations. Poor Benjamin was dead within hours of being interrogated yet Shanmugam seems to profess insights into the state of mind of those who would have reviewed the case. Worse than this Shanmugam decides that a dead teenager whose case never went before a judge or the AG and who never stood trial stood trial was in fact guilty and would have been found guilty. Mr Shanmugam’s lack of professionalism and ignorance of the law doesn’t stop there. He goes on to tell us what the theoretical outcome of decisions not made by him would have been. To quote the man himself according to the state media report, Shanmugam said that “based on the evidence available in Benjamin’s case, it is likely that he would have received no more than a warning, and would not have been charged in court, adding that the police would have taken into account his young age and clean record prior to the alleged offence.” He went on to say “While all molests are taken seriously, the nature of the alleged molest here can probably be characterised as being in the less serious range, based on CCTV footages”. It must be extremely upsetting to Benjamin’s parents to have statements made in public by a double portfolio Minister that have judged Benjamin and found him guilty without trial. As a lawyer Shanmugam knows that his comments are protected by Parliamentary privilege and that as Benjamin is dead he is free to defame him. I note that the freedom to defame a dead person did not apply to Amos Yee, another child who suffered rough justice at the hands of the authorities in Singapore, when he called LKY a horrible person. I don’t quite agree with M Ravi that Shanmugam is committing sub Judice as this is not a case that is going to court but he is clearly defaming a dead boy. In attacking the President of the Law Society, Shanmugam also reminds us of the shameful way our Law Society has been hobbled and prevented from speaking up ever since Lee Kuan Yew’s attack on the Law Society in 1988 during the detentions of the so-called Marxist conspirators. It is an encouraging sign that things may finally be changing after so many years when one spineless Law Society President after another has failed to speak up to protect our fundamental rights and prevent abuse of the rule of law. “The law minister threatens the public particularly the online media with sub judice rule yet in the same breath why is he discussing the case and presenting the State’s version whilst the Coroner’s Inquiry is underway. Why is he even saying that Benjamin would be likely to be let off with a warning . Is Benjamin already guilty?Benjamin is innocent until a guilty verdict is pronounced by the court. Shanmugam who is legally trained should know best but instead he chooses to accuse the law society’s President for writing on the case. The Law Society President was merely echoing the prevailing concerns among criminal lawyers. I have looked at the pictures on CNA reproduced below which show the actual spot where poor Benjamin was interviewed. 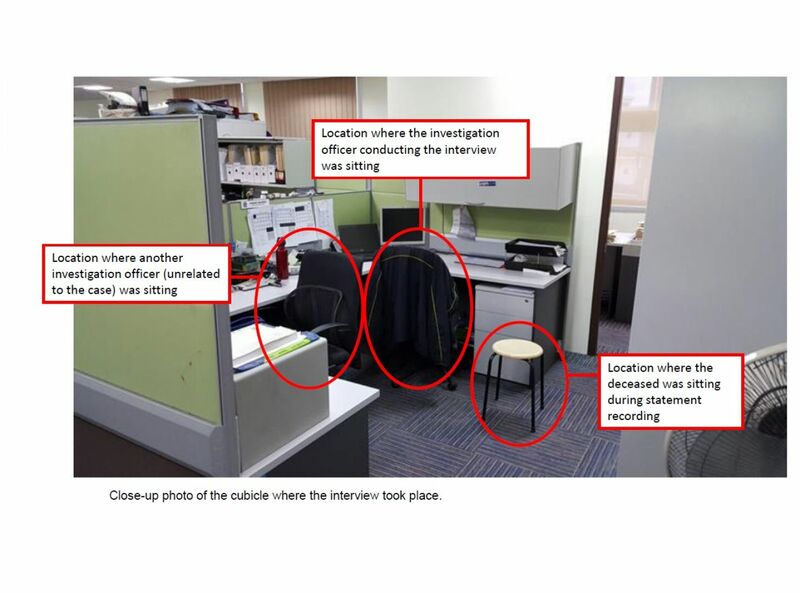 Shanmugam says only one policeman interviewed Benjamin and that his statement was recorded in an open plan office with another policeman sitting a few feet away. It looks like a very public place in an open plan office. This is a boy who has already been hauled away from school by men who were clearly identified by his peers as policemen. Being questioned by the police in the open with everyone no doubt staring must have been humiliating for him. I can see he was made to sit on a small stool which may have been a police technique to rob him of dignity (see picture below from CNA) and it looks like he was on that stool for several hours. Shanmugam is certainly trying his hardest to exonerate the police of any culpability in Benjamin’s death whilst playing the blame game himself and pointing the finger at others. He is doing what the PAP have always done best which is to employ smoke and mirrors to divert Singaporeans’ attention away from the fact that Singaporeans of any age lack basic rights and the protections of a Rule of Law. I hope this tragic death has caused Singaporeans to stop and think and maybe realise that there is something wrong with our Institutions both the educational ones and the criminal justice system. So what can we do to put it right? I know that most Singaporeans get bored with any talk of Rights but I’m not advocating Gay marriage here just the standard protections of Rule Of Law and a Youth or Vulnerable Person Code. After all our children deserve a better society and one that has Institutions which protect their rights whether they are innocent, guilty or just plain obnoxious. The first rights our children need, as do our adults, is the right not to be detained without trial. Remember that Amos was detained before his trial and if he had been found innocent he would not have been able to get that time back nor to sue for false imprisonment because we don’t have that right either. The three men on death row in 1989 (the so called coffee-shop murders) whose innocence my late father proved, were not able to sue for three years of wrongful imprisonment although I suppose they were happy to get out with their necks unbroken. Our legal system is based on the UK system and the UK provides all suspects, not just a juvenile, with the right to have a lawyer present during interrogation and to have access to a lawyer immediately in most cases. You have the right not to answer questions without a lawyer present and the State pays for a lawyer if the suspect can’t afford one. (Here only capital case defendants get a pro-bono lawyer.) However children are usually questioned in a less formal setting such as at the school with an appropriate adult alongside. The US system has similar safeguards and Juveniles have the right to have a parent or appropriate adult present as well as their Miranda rights. This case was recently ruled upon by the Supreme Court. A police officer went to the 13 yr old boy’s school, removed him from class and placed him in a conference room with the door closed and two school administrators present. However the officer failed to give the boy a Miranda warning or inform him that he could leave the room at any time prior to beginning the questioning. The boy later wanted to get the statements he made in the conference room thrown out and the Supreme Court agreed with him. “The Court recognized the fact that, because of their relative immaturity and lack of experience, children “cannot be viewed simply as miniature adults”. You must go with police only if you are formally arrested for an offence or formally detained for questioning about an indictable offence. The police can’t force you to go to the police station without arresting you. If they insist that you go with them, you can ask if you’re under arrest. If not, you don’t have to go. Even if you agree to go to the police station, you have the right to remain silent. Police must allow you to contact a support person (a friend or relative) and a lawyer, and arrange for them to be with you during your formal interview. Police can’t listen to your conversations with your lawyer. Children should always ask if they can have an adult (who they like and trust) present with them in an interview. Sometimes police can question children without another adult present. However, if a child has been charged with an indictable offence, the court can refuse to consider statements from children (16 years and under) if an independent person was not present at the interview. Finally this is a ruling from the UK courts on the treatment of 17 year olds and how they must also be treated as children. I think it’s clear that Singapore treats its children like miniature adults and its adults already enjoy very few rights compared to other advanced democracies. The President of the Law society was quite right to bring up the lack of protections in our system for children. As Benjamin was only 13 years old it is clear that in a country with Rule of Law his confession would have been thrown out by a Court because there was no Independent adult present at the Interview. This is what Shanmugam does not want you to know. That the manner of Benjamin’s detention, removal from school, questioning and statements obtained would all have been thrown out by a proper court, in a proper decent democracy and therefore the seriousness or not of any CCTV images is completely irrelevant. We urgently need legal reforms to safeguard the rights of suspects and further protections for juveniles, the mentally incapacitated and specially vulnerable. More immediately Shanmugam owes Benjamin’s parents an apology. I hope Thio Shen Yi stands up for his principles and pushes back on Singapore’s breaches under the Human Rights Act 1998. Singaporeans have been coerced into accepting that the government know best by the late and horrible LKY. He believes that politics is for the elites and ‘natural aristocrats’ despite having his law qualifications from the United Kingdom, the bastion of democracy! LKY got away with muzzling the press and the whole mainstream media, TV, Radio and Newspapers was brought under his control. From then on ….the truism of ‘Power corrupts. Absolute power corrupts absolutely’ became the political system of LKY PAP’s TOTALITARIAN government. Minister Shanmugam must have thought that he can still get away with non disclosure of the facts that 14 years old Benjamin has rights to adults and lawyers’ representation and then jump straight into the material facts of the events leading to his suicide. THIS IS WRONG! We are citizens with rights. Cover ups should be considered as deception and in this instance made more damning because he is the Law Minister! I’d reiterate: ALL parents must now have the genuine worry that their children are unsafe and unprotected if they are caught in a similar situation like the late Benjamin Lim. Instead of being conciliatory and make good with strict procedures put in place to protect the wayward child with the view of helping him, Minister Shanmugam has resorted to the highhanded and unnecessary tough talking that is totally unacceptable. THE PUBLIC IS RIGHT AND REASONABLE TO CONDEMN THIS RECALCITRANT LAW AND HOME AFFAIRS MINISTER, MR. K. SHANMUGAM. The minister of Law, and minister for Home Affairs past and present are guilty of allowing a very bad protocol remain in place. As the current minister of Law AND minister of Home Affairs, He is ultimately the person most responsible for Benjamin’s death. Is it fair that this happened on his watch? Well, a boy has died, and Mr. Shanmugam is trying to do what a defence lawyer does, whack everyone, say whatever to defray attention and blame. In many country their minister will resign when there make mistakes even it is not their own mistake. S. Korea’s woman President resigned during the Ferry Accident but the government rejected he resignation. Many Japanese Ministers did the same when their staffs make mistakes. Agree. The minister seemed to have got it all wrong. We were waiting for some clarity and enlightenment, but we got instead a heap of totally irrelevant HOT AIR designed to distract rather than elucidate. It’s a disgrace that we paid him a million to hear him now REGURGITATE police procedures WITHOUT an ounce of input on the most important details. Same from the MOE minister. They had a month to prepare their respective statements and this is what we get? I don’t think the Home affairs minister even know his role in parliament as a minister in charge. He had unashamedly abused parliament’s platform and privileges to pursue his personal agenda against the perceived insult to his ministry’s performance by TOC. MAKE NO MISTAKE, NOTHING HE HAD SAID HAS SATISFIED THE NEEDS FOR REAL DETAILS RELATING TO BENJAMIN LIM’S DEATH. Absolutely. The Minister has proved himself to be a poor lawyer if he can’t understand what “sub judice” really means. He is just waving his arms around blowing a load of hot air as you said to silence the debate. In the NKF case he make millions for the State and in Roy case he make $150 K for the PM. When he was Foreign Minister he did not did his duty, that was why he was replaced. I believe he cannot hold the present positions for long. He is born a lawyer not a MINISTER. Yup the police are “defenceless” just like the Mindef which needed to take out an order for Protection from Harassment to stop criticism. Shanmugam is using sub judice to try and achieve the same thing. That was why the AG reported that Police are in lapses, but we heard nothing about it. Police these days just sit on cases but never submit it to AG as there are afraid there will more reports of lapses again. The whole problem began with the repeal in the 60’s of the so-called Judges’ Rules contained in Schedule E to the Criminal Procedure Code which provides minimal protection for persons being interviewed and interrogated by the police. David Marshall was up in arms and called for the tape recording of such interviews and interrogations in an article in the Malayan Law Journal – to no avail. Nearly 50 years later, the Minister is merely considering tape recordings or videos. The established democracies have moved forward since then to protect vulnerable suspects. The UK now established by Code C detailed provisions for such protection, particularly with regard to children and young persons. What is needed is not some “police protocol” but written rules of law. You will note the Minister’s reference to “rules” being followed without identifying them. There is reason to believe that none exist, at least with regard to minors, having regard to the train of events outlined by the Minister. Criminal lawyers will tell you that in nearly all cases the prosecution will rely of confessions obtained and, in many, formed the basis for conviction. This has led to a deterioration in proper investigating standards.The Minister has taken to a favourite strategy of litigation lawyers – attacking as a defence- a technique that is bound to fail in this new era of social media. Your analysis is spot on. I’m not a lawyer but we lack any safeguards to protect suspects, let alone minors, starting with the right of the police to detain suspects without trial and to deny them access to counsel. We are badly behind democratic countries and the problem is that Singaporeans are not bothered or think it will never happen to them only to criminals who deserve what they get. Nobody commented on what the molest victim and what she went through. Next people will be blaming her parents for having reported to the police. Shame on you, Shanmugam. What about forgoing or accepting a cut in bonus or salary increment as punishment for poor performance? He will be expecting a raise as he talk in Parliament whereas many are just there to watch the show. Shanmugam is not talking any sense. For God’s sake how did he get to be a Senior Counsel supposedly earning millions? PAP pays him and if you like to make millions too join them PAP, pray and pay. Just sue men you do not like like the NKF boss and Roy who use a wrong sentence. Shanmugam is only good as a lawyer and failed badly as a Cabinet Minister. He fair badly as a Foreign Minster and is now be replace to be Home Minister and he fail again when he make speech about the oppositions when parliament have close the case and accepted the new NMP proposed by the Opposition who did not vote. Than again bring up the management of the Town council when the case have gone to courts. I wanting if he is above the Law or don’t know the LAWS? Anyway, there is no law against Power Corruption.